Big 5 - Elephant" by Caitlin is licensed under Creative Commons Attribution 2.0. 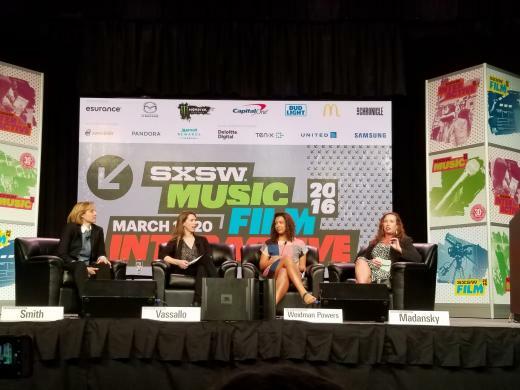 At SXSW Interactive 2016, I had the amazing chance to attend a panel of visionaries talking about lack of women in the tech industry. The panel included: Michelle Mandansky, Laura Weidman Powers, Trae Vassallo, and Megan Smith. Michele painted a picture for us from 1984, when she was in college learning Pascal and 35% of computer science graduates were women. She says that was the peak, and now only 19% of women graduate with Computer Science degree. Then, came the question: Do you know Thomas Edison? Everyone. Do you know Grace Hopper? A few. Despite her inventions being equal in many ways to Edison's. Even for me, I personally didn't know who Grace Hopper was until I started working in open source where I learned about the Grace Hopper Conference. This panel thinks we don't have enough female mentors, because until people actually see others like us doing a job we understand it as a possibility for ourselves. Kids—boys and girls—need hands-on experience early on to bring them in to STEM. The big problem? Women and minorities don't want to work in a field that doesn't want them. It's challenging. I work with ChickTech Austin where one of my goals is to find women mentors for the girls learning from us. I love getting to tell girls that I'm a Vice President in a tech company and get to manage a team of all men. That impressed them! And, it shows that if you push and believe in yourself you can succeed in tech. Another topic of conversation on the panel was implicit and institutional bias. Overt bias is not happening as often, but what's going on behind the scences or in people's minds? In some institutions, it can seem that women are overpaid, but the truth is that they're under promoted; this is due to institutional bias. Then, there's sexual harassment. A little over a year ago, Trae had to testify in a hearing on the subject and was shocked by the outpouring of stories that were sent to her from women who had similar experiences. From this was born the Elephant in the Valley survey. We asked 200+ women focusing on women with at least 10 years of experience. The survey is largely bay area with 91% in the bay area/silicon valley right now. We have a broad age ranges with 77% 40+ and 75% have children. Our respondents hold positions of power and influence with 25% are a CXOs, 11% are Founders, 11% are in venture. In addition to capturing start-up data, we also have employees from large companies including Apple, Google, and VMWare. We encourage you to read, discuss, and add your anonymous stories to this initiative. It's even more challenging for women of color who say they can feel either hyper-visible or completely invisible. What can we do? Like it or not, right now women and minorities need to learn to be comfortable with feeling uncomfortable (keep in mind that feeling discomfort is not the same as feeling unsafe). We have to push through our discomfort to succeed, and we have to share our stories. When the website first went up for the Elephant in the Valley survey, over 500 women sharing their stories anonymously. There is strength in numbers. And, we have an opportunity take action.